Palm Resort is situated strategically at the southern most tip of Peninsular Malaysia between Thailand and the Republic of Singapore. Ensconced within the State of Johor, it is infra-structurally endowed with modern access by road, air and rail. Set against the natural backdrop of rolling green hills, Palm Resort is located just at the turn of a corner i.e. 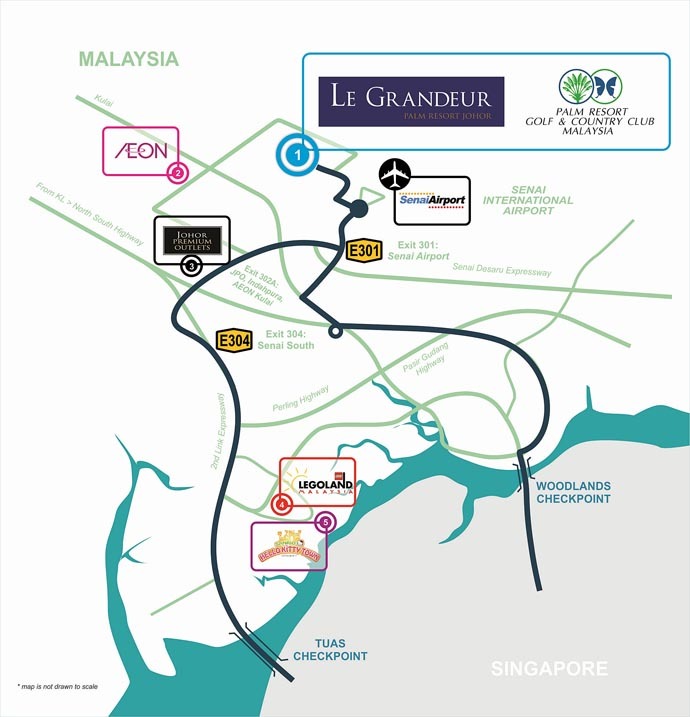 3 minutes drive from Johor Bahru's Sultan Ismail Airport, 30 minutes drive from Johor Bahru's city centre. Whether it is via the main Johor Bahru-Singapore causeway or through the second-link crossing, Singapore is accessible within 45 minutes. There are three routes to access Palm Resort. Route 1: From the JB-Singapore Causeway. Get directions. Route 2: From the Singapore-Johor 2nd link via Airport Interchange. Get directions. Clothing Light, casual summer wear. Dress codes applicable to certain entertainment outlets and religious/formal functions. Tipping Not necessary if service charge is included. Otherwise, upon individual's discretion.